KS Milesplit's FREE Spotlight Video of the Week! Hutchinson wins the Elite Boys' 4x100m at the Shocker Pre-State Challenge with a new state-leading time of 42.85! 2019 Kansas Relays HS FINAL ENTRY LISTS! The official 2019 Kansas Relays HS accepted entry lists have been released! Top Performances of the Week - Week 4! Excitement around the state for both small schools and large schools continues to show! State's middle distance, distance runners are hitting their stride halfway through the 2019 season. How to Upload Live Results! 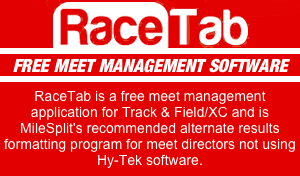 Milesplit live result hosting is, not to mention free, but also convenient to the whole Kansas track community. Read this article to learn how to try it out at your meet today! Kansas' Performances of the Week - Week 3! KS Milesplit's FREE Video of the Week! Leavenworth High School takes the top time in the state in the girls 4x400m (away from previous top-time holders St. James Academy) in a fast time of 4:06.79 to end the Leavenworth Invitational. View the top ten for free, and then view the rest of the rankings with a subscription today! The top performances from the week across all events!